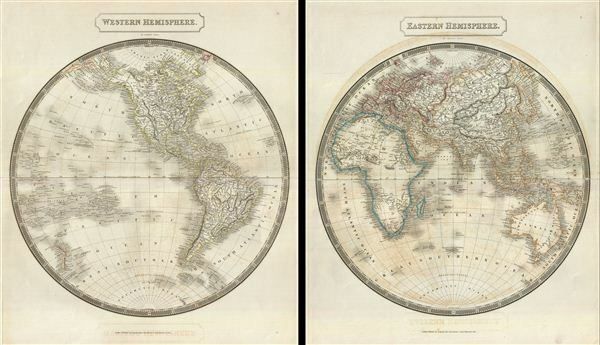 This is a beautiful set of two maps of the World on hemispherical projections from Sidney Hall's extremely scarce 1835 New General Atlas. They depict the Western and Eastern Hemispheres offering a fascinating snapshot of the world during a period of rapid globalization and discovery. Both maps note towns, rivers, mountains, deserts, islands, and various other important topographical details. Elevation throughout is rendered by hachure and political and territorial boundaries are outlined in color. The map of the Western Hemisphere covers North America, South America, West Indies and most of Polynesia, including New Zealand. The borders of the United States predated the Annexation of Texas and the Mexican American War, but include Oregon. In a unusual move for a British cartographer Hall recognizes American rather than British claims to the British Columbia - Vancouver region. Perhaps his sympathies secretly lay with the former colonies? Numerous islands are identified along with notes on their discovery. Near the southern tip of South America, Hall marks the Aurora Islands 'doubtful.' The Aurora Islands were a group of three islands first reported in 1762 by the Spanish ship Aurora while sailing from Lima to Cadiz. They were subsequently and repeatedly sighted several times over the next 90 years. The last official sighting was 1852, after which they were ascribed to myth. Though the Aurora Islands never really existed they continued to appear on maps well into the mid-19th century. Wessell's voyage to latitude 74°15' S (the region that would later be known as the Weddell Sea) is here noted. Hall also marks the southernmost point of Captain Cook's explorations aboard the HMS Resolution. It was this voyage that decisively proved the postulated continent of Terra Australis to be a myth. The Antarctic continent, first sighted in 1820, but neglected during the first half of the 19th century, does not appear on the map. Very good. Original platemark visible. Minor wear along original centerfold. Some offsetting on Eastern Hemisphere sheet. Blank on verso. Size indicated represents a single sheet. Both sheets are the same size. Rumsey 4224.001 (1830 edition). Philips (Atlases) 758. Ristow, W., American Maps and Mapmakers: Commercial Cartography in the Nineteenth Century, p. 303-09. Tooley, R.V., The mapping of Australia and Antarctica, 2nd ed., p. 92-93. Wheat, C.I., Mapping the transmississippi West, 380, 381, 386.